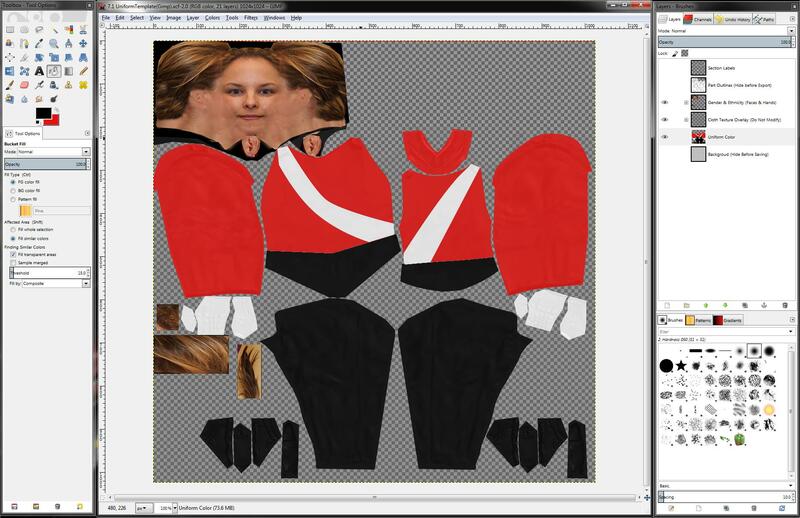 Before we get started, now would be a good time to familiarize yourself with the layout of GIMP. The panel on the left of the design (or workspace) area is the Toolbox. This is where you will find tools for selection and editing. The window in the middle of the image is your workspace. This is where you’ll be adapting the uniform for your ensemble. The panel to the right of the design area is the Layers panel. This panel lists all layers of an image. The Layers panel also has quick access to the various paths for the image, whether provided in the template or created by the user. We’ll briefly discuss paths later on. Click through to the next topic, Creating a New Uniform Layer, to continue.